Profile: Our Lady of the Lake University is a private Catholic university with a deep connection to the history and community of San Antonio. Founded in 1895 by the Congregation of Divine Providence, the campus is famous for the beautiful lakeside grounds, which mix historic buildings with a contemporary library, residence halls, and technology infrastructure. A 2008 fire damaged all four levels of the Main building. It was the city's first four-alarm fire in nine years. 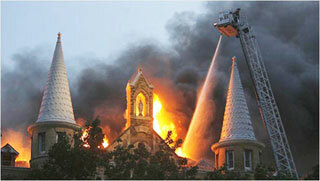 More than 100 firefighters from the San Antonio Fire Department battled the blaze. No lives were lost in the fire. Services: DataCom Design was selected to provide the technology design and consulting for the extensive renovation project that involved the assessment of current site conditions, coordination of multiple infrastructure systems, related project codes, and implementation management. DataCom provided the low voltage design for the project including IT, AV, security, and outside plant design.